If you have MTS, it's unlikely that you can get rid of em. One strategy is to lower the kH and keep it at 0. This may keep them at bay but the mini ramshorns still survive in those conditions. MTS can and will evade many snail eaters. If you are serious about snail eradication, you may need to consider freshwater puffers. I saw one around the fissiden, a single one, and failed to remove it. anyway, I've decided I'm not serious about the eradications and all, I only plan to remove any that stuck to the glass or are easily grabbed with my long pliers when they're big. I don't mind seeing them around the tank really, I'm just concerned about the issues they may bring on a tank. as long as their population is controlled I'm good. Another day, another different fight to pick. This time BGA. I don't like the rate of flow coming through my lily pipes, they seem to skim the surface well enough but it doesn't reach to the end of the tank, and definitely not the bottom. Tried adding a stream pump but that seemed to cause the inhabitants of the tank to be caught in a whirlpool storm. so decided to just pop the spray bar back. At least I know that one shoot to the end and bottom (I position it to shoot down diagonally) of the tank decently. we'll see if that slows them down enough. 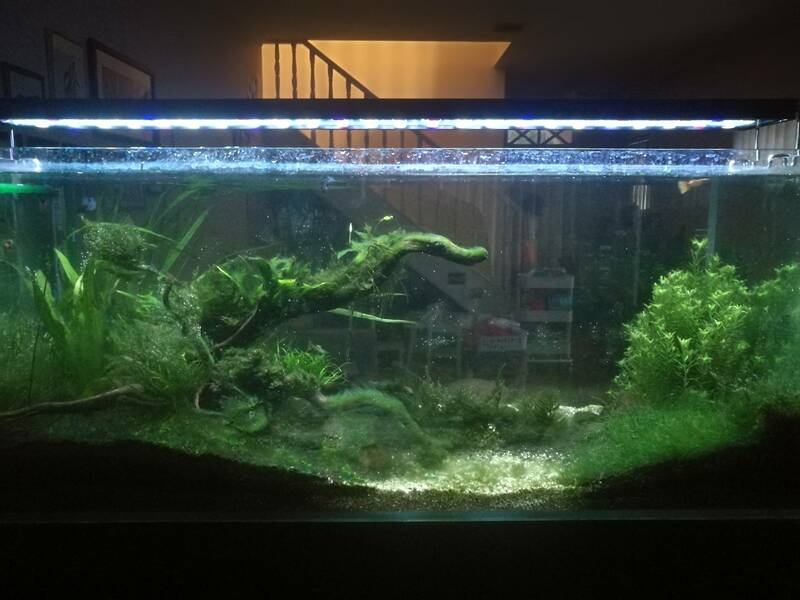 Quick question: if the hair algae is going crazy after you dose fertilizers and CO2, would you reduce or increase lighting assuming you still want to dose the same amount? reduce light and keep everything else the same. Remove algae daily. Green hair algae can be a tricky problem as it can thrive in the same conditions as plants. Black mollies, darwin shrimp will eat hair algae. my tank currently have the NQ Algae Shrimps there, which I believe kept things tidy in one area... but I think having only 20 of them in that tank means it isn't enough, as most of them are hanging out in one corner of the tank. one half of my tank is clean, while the other is messy lol. godiscus, this was precisely the question I had above about cleaning! hahaha please let me know how you go!! how long until you need to clean the inline atomiser? Well I finally did it. It was relatively easy. I lifted the inlet and outlet out of the water to stop syphon. Disconnected from filter which closes the hose. Put that piece (what ever its called, wish I knew now) into a bucket and opened it up. Water from tubes drained into bucket and then removed the diffuser. Cleaned in bleach while I did water change. Rinsed, rinsed and rinsed in Safe. Reassembled. Maybe only 1 hour. Been a week and the CO2 bubbles are actually much smaller than previously. I suppose I had waited about 2 months before cleaning. Nice! Thanks for this godiscus, I'm assuming Prime works to rinse with as well? 2. that's where the shrimps like to hang out. I tried getting the shrimps to move away from that corner and after I figured out that guppies can eat algae too I decided to stop feeding the guppies since I believe the shrimps are eating these pellets as well. seems to work, as I'm seeing more bald patches around the driftwood these days, which means the shrimps are munching on it. 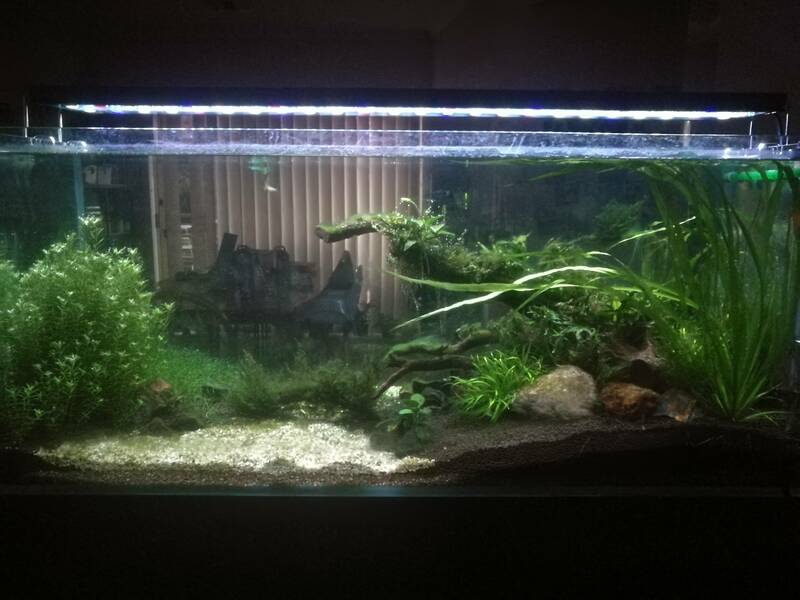 That said apart from the algae, I'm pretty happy with how it turned out. It kinda looks like how I envisioned it. The only thing is the spread of the white gravel was probably too wide, which makes it rather empty but I'm still not sure what I want to do with it yet. The anubias nana on top of the driftwood flowered once and seems to about to flower again, and I think the blyxa is putting up a flower shoot? I am glad you are chilled about the algae situation. Yep it will hopefully pass. I would also suggest to take it out daily and every time you walk past the tank. Don't rely wholly on the shrimp etc. For those stems, I reckon you should trim them about 50% and let the stems just float on the top for a few weeks to aid with algal control. Yeah, well I mean I know the big reason for the algal bloom was because I was late in dosing the fertiliser. All kinds of algae has established by then, and dosing the fertiliser after that... well, it's as you see. I have been taking them out daily(because I'm not as chilled about it as I thought lol), and since reducing the lights I can at least start to see that the bald patches aren't growing these algaes at the same rate as the lush ones, so the hypothesis at the moment is once these algaes are taken care of they won't actually grow as bad. Seeing as I plan to stock otos in the long run algae-free tank isn't necessarily a good idea anyway. Long as I'm not rushed, I don't actually mind taking out the algae myself. And since I know it doesn't really bother the tank inhabitants I can relax about it. The only one I'm not really chilled about is the BGA, as I heard they could be choking the plants and may actually harm the fish if they eat it. HAha you are unlocking new achievements as you speak! Soon you will be a boss. For BGA, You can try squirting the ferts directly on it with filters off. While others disagree, I am usually very quick to reach out to my chemiclean because it rids it within a week or so. But that one you linked is WAYY cheaper! I've never used it tho. Right. The description makes it sound similar, I think the one I linked is based in USA. that said, I'm using it atm. I started on wednesday night and plan to top-up tonight, but I think I can already see improvements in that, I'm actually planning to order another one for future backup because it took 2 weeks from my order time to arrive. The shrimps are starting to get more active around, and as a result on top of the reduced lighting started seeing better control of algae. Dunno if it's because they've all finally finished their molting around, or the 5 cardinal tetras that I bought started putting them out of their comfort zone. 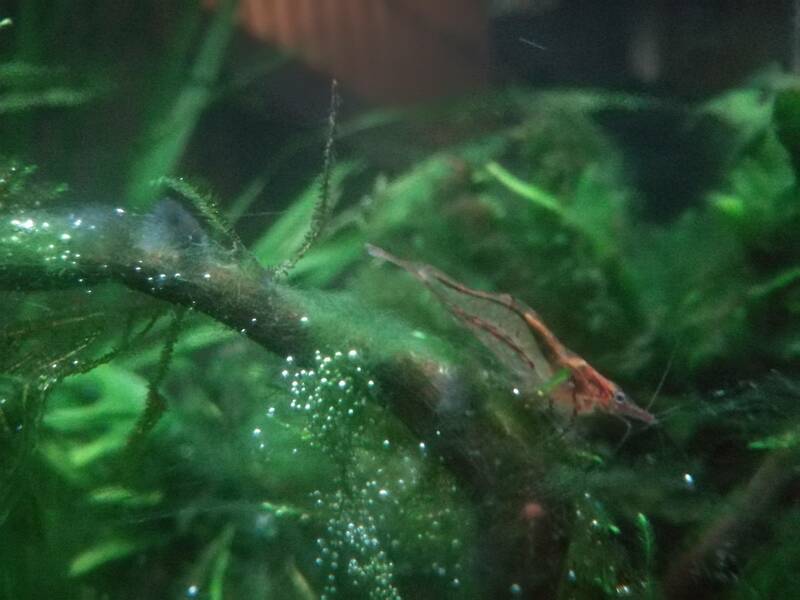 interestingly I also found some baby shrimps a few days ago, hope some survive. BUT it won't be my tank without new issues to find. This time, *drum roll* planaria AND hydra!